With a working height of 30 ft this is a compact push-around Aerial Work Platform, AWPs. 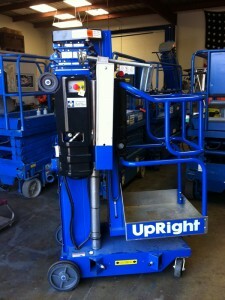 This model uses a composite aluminum mast and is 300 lbs lighter and more stable at full height than other AWPs around. We also carry a UL-32, UL-40 as well as a UL-48. Check out our Super Straddle for theater work!